Hazratganj Chauraha in Lucknow to be renamed after former Prime Minister Atal Bihari Vajpayee as 'Atal Chowk'. Lucknow will also develop a memorial for Atal Bihari Vajpayee. Lucknow's famous 'Hazratganj Chauraha' will be renamed after former Prime Minister Atal Bihari Vajpayee as 'Atal Chowk'. 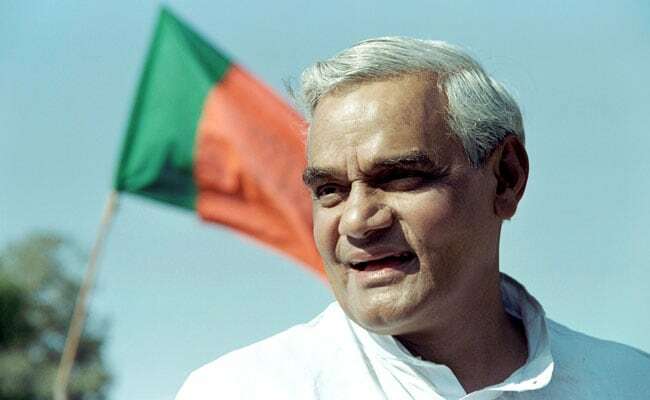 City Mayor Sanyukta Bhatia told ANI, "A number of councilors were demanding different roads and round-abouts be named after Atal Bihari Vajpayee. However, we were looking for something grand enough to fit the stature of the former Prime Minister. Hence it has been decided that most prominent and biggest intersection of Lucknow, which is also referred as the heart of the city- "Hazratganj Chaurha' will be named after Bharat Ratna Atal Bihari Vajpayee". She further informed that they will also build a memorial for the late veteran leader, who was a five-time Member of Parliament from Lucknow. "We want to conserve the memories of late Prime Minister Atal Bihari Vajpayee. As the mayor of the city, we have prepared a draft for developing a memorial for him named "Atal Smriti Upvan". In this memorial, we plan to place his statue along with his 51 poems, speeches and other memorabilia. We have already started a process for identifying land for this memorial," she said. The decision was taken in an executive council meeting of Lucknow Municipal Corporation. BJP councillors, and councilors from opposition parties, supported the move. Earlier, several states announced to rename some places after Mr Vajpayee to honour the leader. On August 21, the Chhattisgarh Government announced to rename Naya Raipur as Atal Nagar. Besides, the BJP-ruled state also decided to rename few other places and institutions after his name. The Jharkhand government also renamed several places and colleges after Vajpayee's name. Sahibganj Harbour was renamed as Atal Bihari Vajpayee Harbour Sahibganj. Medical College Palamu and Professional College Jamshedpur were renamed as Atal Bihari Vajpayee Medical College, Palamu and Atal Bihari Vajpayee Professional College, Jamshedpur respectively. The 8-lane road from Government of India building to Kako Math in Dhanbad district was named as Atal Marg. The 93-year-old leader died on August 16 at the All India Institute of Medical Sciences in New Delhi after a period of prolonged illness.